Want to get your kids more involved in the kitchen? Or just want a solid way to up-cycle leftovers? 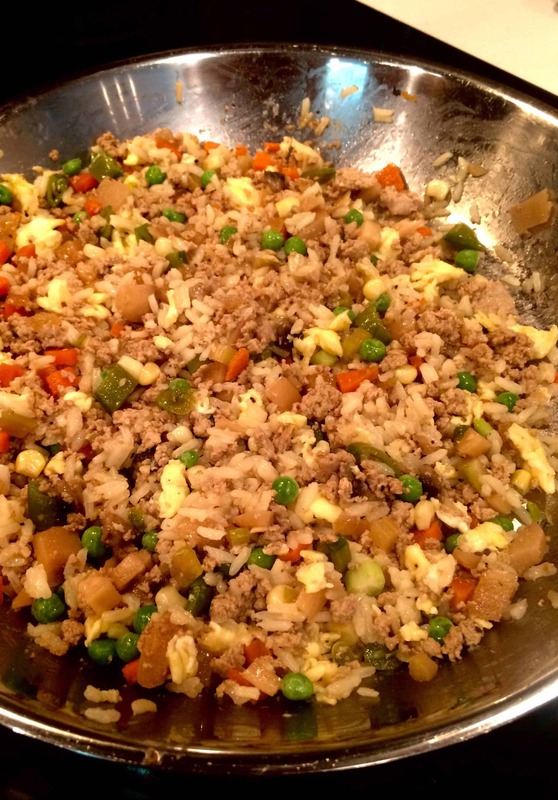 A little leftover cooked rice (or noodles), some leftover vegetables supplemented with some fresh ones, an egg or two, some meat … Fried Rice. 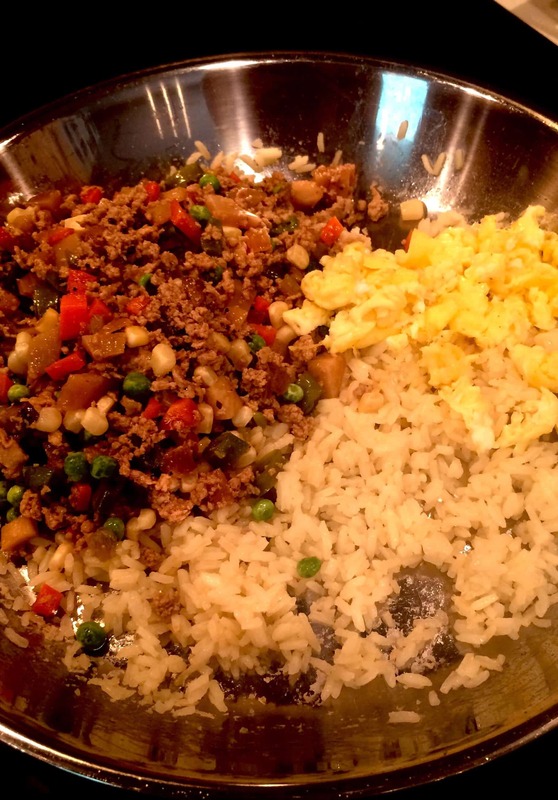 One of the keys to making fried rice is the same as one of my tips for getting kids to try new foods or foods they don’t think they like: cut things small. You want the ingredients to cook (or reheat) quickly and evenly so you don’t take leftovers and turn them into dehydrated bits. When using leftovers, set them out of the refrigerator for 30 minutes prior to reheating. If you take the chill off of them first, it won’t take as long to reheat which in turn preserves the flavor and texture. Eggs – Whisk them in a bowl and cook them like you would for scrambled eggs or an omelette; remove from the pan and cut into small bites. Fat – you have to revive and unite the flavors. I use a combination of an Omega-3 vegetable oil blend and a small amount of sesame oil. Asian seasonings – fresh ginger, garlic, crushed red pepper and lemon. Cooked rice/noodles – this can be leftover rice/noodles or you can cook it and let it cool before re-frying. A short cut is to keep Uncle Ben’s Instant Brown Rice on hand. It cooks in 10 minutes and although it is quick cooking rice it still maintains a firm texture and nutritional value. Veggies – carrots, onions, celery, broccoli, corn, peas, green beans (fresh, canned or frozen), mushrooms, water chestnuts … anything you like in your stir-fry dishes. Defrost frozen vegetables before cooking. 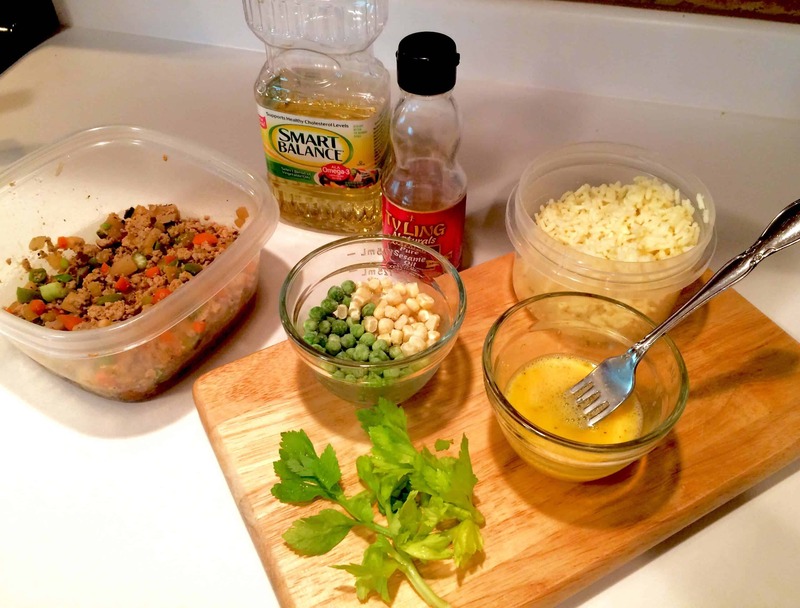 Meat – I typically use leftover chicken or pork cut into very small pieces. You can also just use extra eggs and skip the meat. 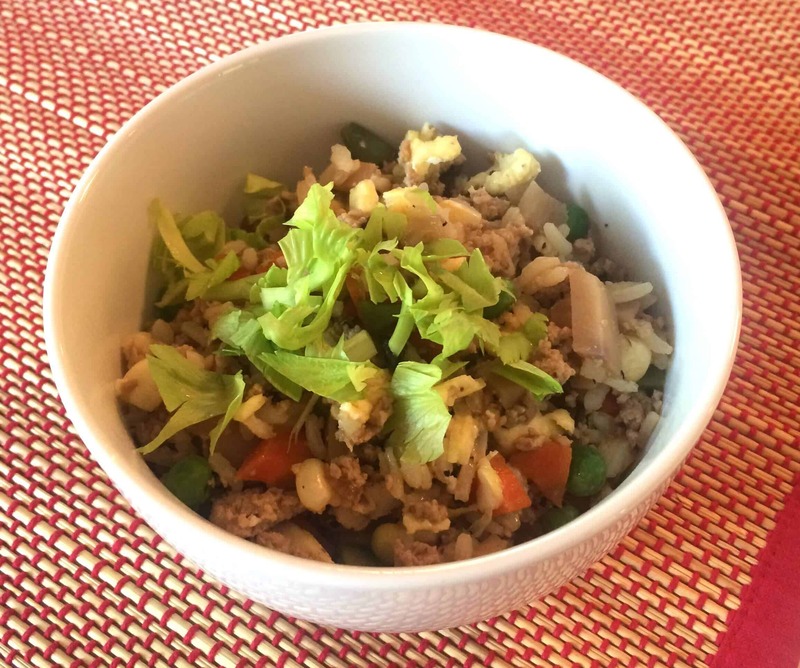 In these pictures I used leftover ground chicken from some Asian lettuce wraps. Sauce – soy sauce, sweet-and-sour sauce, sriracha sauce, schezuan sauce, or a mixture. Take a large non-stick skillet and add 1-2 tablespoons of oil(s) over medium heat for 2 minutes. The oil(s) should be hot enough to sizzle when ingredients are added but not hot enough to splatter or burn the ingredients. Add 1-2 cloves garlic minced, 1/4-1/2 teaspoon crushed red pepper (optional), and 1/2 teaspoon freshly grated ginger. Stir into oil. Add vegetables that require longer cooking times like carrots, mushrooms, fresh green beans and onions and a pinch of salt. Cook 2 minutes, stirring frequently. Add next group of vegetables with similar cooking times like broccoli and celery (we want these to maintain their crunch and color), add another pinch of salt and cook 2 minutes. Stir in final group of vegetables which only need to be heated through like peas, corn and water chestnuts, add a final pinch of salt and cook 2 minutes. Remove vegetables from skillet into a serving bowl and set aside. Return skillet to burner and add another 1-2 tablespoons of oil and heat over medium heat. Add rice, spreading into an even layer. Do not stir for 1 minute. Flip rice over with a spatula and allow it to “fry” for another minute. Add meat and stir. After 1 minute, add vegetables and scrambled eggs, folding to distribute all ingredient evenly. Remove from heat. Drizzle with a small amount of fresh lemon juice (optional). Serve with diced green onions, chopped cilantro, and/or chopped celery leaves and sauce(s) of choice. Fried rice is great kid-friendly food because they can be involved in so many stages of the cooking: choosing the vegetables (just tell them there has to be at least 3 or 4 to make it look good), whisking the eggs, chopping some of the vegetables, squeezing the lemon, decorating their bowl with the fresh toppings or sampling a variety of sauces.